It was 4am, and Yuri couldn't sleep. In fact, he hadn't slept for several nights. 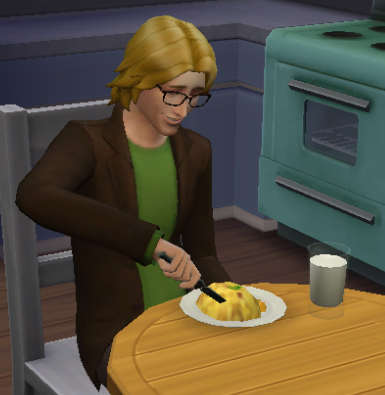 Instead, he'd sat up for hours at his kitchen table, stuffing himself with bizarre concoctions of comfort food. Tonight's dish was the warped combination of mashed potato, jellybeans, and butterscotch sauce. It had been weeks since he'd last seen Crystal. She had disappeared from his life the morning that he woke up in bed alone. Yuri had called her, e-mailed her, gone to The Comet Club night after night looking for her... but it was no use. It was as if she'd vanished off the face of the Earth. Yuri was heartbroken. Whilst he had never been a model employee, he was now completely unable to focus on anything at work. He didn't go out with his friends anymore, or tell jokes, or even smile. He had transformed into a completely different man. There was just one person Yuri wanted to talk to... but he couldn't. He had hurt him too much. After everything he'd said to him, everything he'd done... Yuri couldn't bear to face him again. He was too ashamed of his actions. And yet, this was the one person who might be clever enough to help him - to track down Crystal. Yuri really needed his big brother. No. No - it was out of the question. Michael would never forgive him. He would simply say that he'd had this coming... that he'd brought it on himself. At work, Yuri sat staring at the closed door of Michael's office, desperately trying to find the courage to go inside... but he never could. As far as Yuri could see, he had made his bed, and now he had to lie in it. And so, here he was - alone in the kitchen of a house that seemed so much bigger now that he was the only occupant. 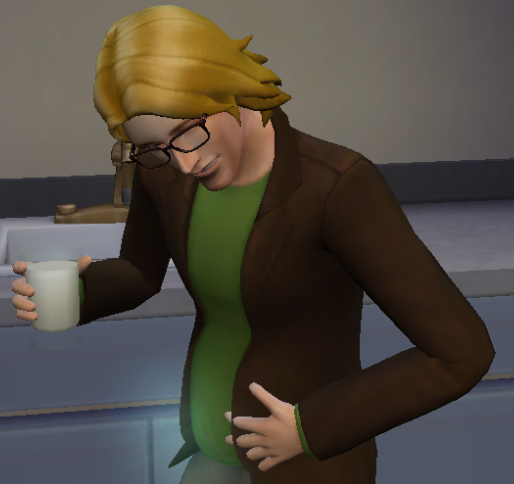 His unusual midnight feast complete, he scuttled to the fridge, poured himself a glass of milk, and chugged it greedily. 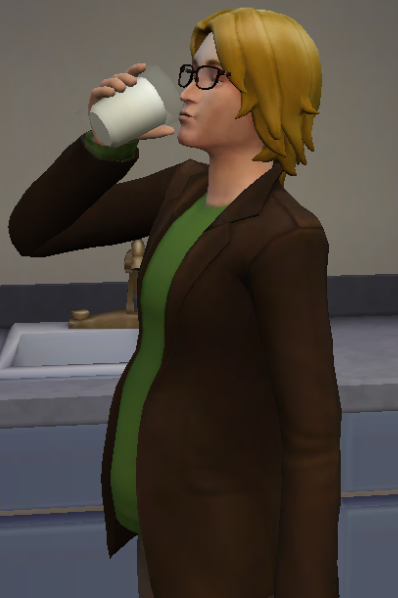 It was his third glass of the night. It was funny - as a child, he'd never liked milk, but lately, he'd developed something of a taste for it. Suddenly, Yuri gasped as a crippling pain shot through his stomach. The glass tumbled from his now-open hand, smashing into shards on the cold tiled floor. As Yuri gasped for breath, the pain slowly subsided, and after a minute or two, he was once again able to stand at his full height. "All this stress must be getting to me," Yuri thought. "Perhaps I'm getting an ulcer, or something." After he'd quickly swept up the glass shards with a dustpan and brush, Yuri returned to his bedroom, lay down on his bed, and tried to sleep. He was already miserable, ashamed and alone... he didn't want to add "ill" to that list. It was no use. He simply couldn't rest. 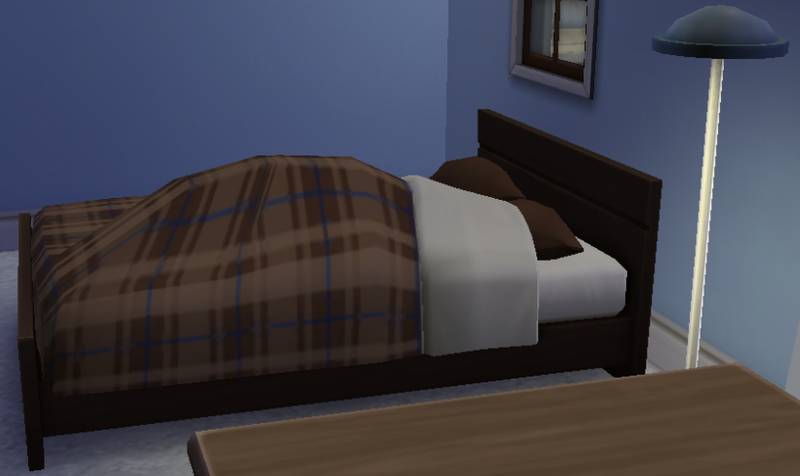 Instead, he pulled the sheets up over his head, and cried. Weeks turned into months. There was still no sign of Crystal. Yuri's late night snacks had begun to affect his figure. His police uniform, once a perfect fit, was now far too tight. Out of the corner of his eye, he would catch his colleagues pointing, laughing, and whispering harsh comments to one another about his large, round stomach. However, Yuri didn't care. He didn't care about anything anymore. He had lost the woman he loved, lost the support of his brother, and time had done nothing to help either situation. Food had become his one source of comfort. Besides, ever since Crystal had vanished, Yuri had suffered from an ever-growing sense of hunger. He wasn't sure he could stop snacking even if he tried. Unbeknownst to Yuri, Michael did still care about him. In fact, he was getting rather worried. 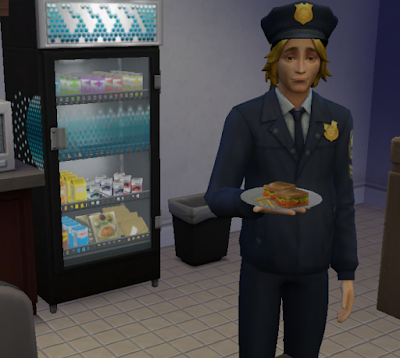 This sad, miserable man that haunted the staff kitchen each day wasn't the Yuri he knew. He sometimes watched Yuri secretly from the other side of the break room as the younger Lee Harker helped himself to a third grilled cheese sandwich. Furthermore, he too had heard the rather tactless remarks being passed by his colleagues... and Michael had dragged more than one of them into the Interview Room for a severe talking-to. Michael knew that Crystal had vanished. With the wave of thefts slowing down, and no reports relating to the "Commander" in recent weeks, Michael had asked a few members of his team to take up the task of locating one Crystal Cross. Unfortunately, their investigations had yet to find any trace of her. She didn't even seem to have a fixed address. Michael desperately wanted to speak to Yuri, to discuss recent events, to help him through everything. Unfortunately, just like his brother, he felt unable to break down the wall that had been built up between them. Surely, Yuri blamed him for everything that had happened. After all, he had disliked Crystal from the beginning. Perhaps it was his coldness, his lack of trust, that had frightened her away? Did Yuri see it that way? No - it was better for him not to interfere. He would be there if his brother wanted him to be, but it wasn't his place to interfere in his affairs. He had caused enough trouble that way already. Still... surely there was somebody who could help Yuri? Returning to the safety and privacy of his office, Michael locked the door, picked up his phone, and dialled a number. After hearing ring after ring, a wave of relief washed over him when he finally heard a voice on the other end of the line. "It is I," Michael said. "I need you to do something for me..."
As Yuri sat home alone later that evening, idly watching a TV show in a desperate attempt to distract himself, he was stunned to hear the sound of someone knocking on the door. He waited eagerly for a few seconds, making sure he hadn't dreamt it. When he heard the knocking once more, a large smile spread across his face. "Crystal!" he cried, leaping to his feet. "She's come back!" ... only to find his father stood there on the porch. "Oh," Yuri said, making no attempt to hide his disappointment. "It's you, Dad. What's up?" "Michael asked me to come and see you," Gabriel told him. "Yes," Gabriel replied. "He's been worried about you. I know things haven't been great between the two of the you lately... but he's still your brother. He cares about you." "Then why didn't he come here himself?" Yuri thought, but he didn't say anything. "May I come in?" Gabriel asked, bringing Yuri out of his ponderings. "Sure," Yuri said, standing aside to let Gabriel through. 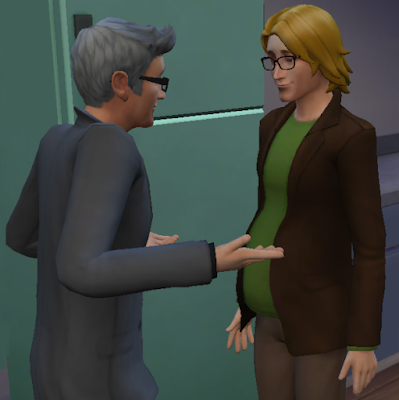 As Yuri closed the door behind him, Gabriel turned to look at his son. Like everyone else, the first thing he noticed was his dramatic change in size. "My goodness, boy!" he chuckled, light-hearted and humorous. "Look at you! You look just like I did when I was..."
He stopped, suddenly, as a disconcerting thought crossed his mind. The jolly smile vanished from his face. Yuri looked at him anxiously. "Son," Gabriel said, his voice now grave and firm, "tell me... have you been feeling sick at all?" "Well, yeah, a little bit," Yuri replied, "but I've been worried a lot recently. You can get sick if you're worried, right?" "And have you been eating anything unusual?" "Well, I've been craving sweets lately, and I've been drinking the odd glass of milk. Why do you ask?" Gabriel gave Yuri a solemn look. "Son..." he said gently, "we need to go to a pharmacy. Right now." At the family home of the Lee Harkers, Katerina walked into the living room, carrying two large mugs of cocoa: one for herself, and one for Michael - who was sat on the sofa reading a book, as usual. Michael had been staying with his parents ever since the "goings on" between him and Yuri, and Katerina, for one, was glad to be spending more time with at least one of her sons... even if it wasn't in the best of circumstances. Just as Katerina had settled down into an armchair, the phone began to ring in the hallway. Katerina started to get up to answer it, but Michael gestured for her to stop. "No, Mother," he said. "Relax. I shall get it." As Michael went to answer the phone, Katerina leant forward in her chair and watched him, eager to know what was going on. Who was calling so late at night? Was Gabriel OK? What was happening? Her fears grew when she saw a solemn expression crossing Michael's face. All he said to the caller were five words. With that, he hung up, and rushed towards the door. "Who was that?" Katerina called. Michael didn't stop to answer her. 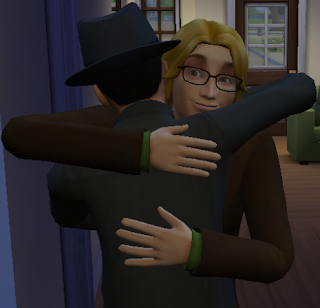 Upon reaching Yuri's house, Michael was greeted by his father. "Yuri's in his bedroom," Gabriel said. "He's gone into hysterics, and I can't calm him down. He really needs you right now." "Are you sure I should talk to him?" Michael asked. "Yes," Gabriel replied. "He's been asking to see you." Whatever happiness and relief Michael might have felt at the moment were far outweighed by his concern for his younger brother. "What has happened?" he asked Gabriel. Gabriel had to pause for a moment before giving his answer. Upon hearing this, Michael was shocked, but did his best to keep straight-faced. The last thing Yuri needed now was another worried person around him. "When was he abducted?" he asked. "That's the thing, Michael," Gabriel replied. "He says he wasn't. He doesn't understand how this has happened... and to be honest with you, neither do I." Michael exhaled deeply, still desperate to stay level-headed. Without another word, he walked into Yuri's bedroom. He found its occupant curled up and weeping at the foot of the bed. "Oh, Michael!" Yuri wailed. "I'm sorry! I'm so, so sorry. All those awful things I said -"
"Hush!" Michael said, taking his brother's hand and helping him to his feet. "None of that matters now. I just need you to tell me what has happened." "I don't know!" Yuri replied, his voice panic-stricken. "Dad made me take this test... it says I'm pregnant. But... but I can't be! I wasn't taken by aliens! I'm sure I wasn't! I'd remember - wouldn't I?" Michael considered the facts carefully. 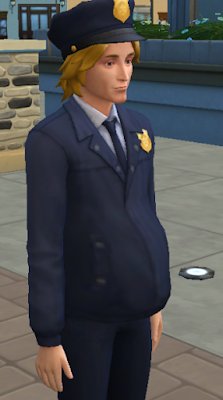 His brother was pregnant - there was no doubt about that. Yet, he claimed he'd not been abducted by aliens, and human males could not get pregnant by their own species. There was no explanation for Yuri's current state. The strange feelings he'd had around Crystal - around the robbery suspects. The feeling that was something not quite normal about them... something not quite right. And with that, the final piece of the puzzle slid into place. The truth hit Michael like a lightning bolt. "Yuri," he said, "You are right. You were not abducted by aliens." "No, Yuri. You fell in love with one." "You mean... Crystal?! She's... she's...?!" "Yes," Michael replied. "She is an alien. And, I suspect, the mother of your child. It all makes so much sense now!" Yuri slowly tried to take in this news. "A baby..." he whispered, still barely able to cope with the idea. "I - I'm carrying Crystal's baby..."
He placed his hands on his bump, awe-struck. What was once a source of shame for him was now his prized feature, as it proved his love for Crystal. Having been distraught at her sudden departure, it comforted him to know that a part of her was still with him. His joy, however, was short-lived, as panic once again set in. "You have to find her, Michael!" he cried. "Crystal has to know about this baby! And I... I don't want to be a single father! I... I won't be able to cope! I'm too silly and stupid and - "
"You will be a great dad, Yuri," he said, smiling. "But do not worry - I am going to go and find Crystal for you." He laughed, and placed his hands on Yuri's bump. "I want what is best for my future niece or nephew." Yuri laughed too, delighted by Michael's words. "You hear that, little one?" he said, addressing the child he was carrying. "Uncle Michael's going to find your mother!" After their laughter had subsided, Yuri looked at his brother, and sighed. "Michael..." he said, "I really am sorry for everything I said and did to you. You were just trying to look out for me, and in a way... I guess you were right about Crystal." "I am sorry too, Yuri," Michael replied. "I went too far. And believe me - I never expected Crystal to do something like this. I will admit that it may be some time before I can fully trust her, but if she makes you happy, then I can ask nothing more." Both relieved to hear that the other still cared for them, the two brothers embraced each other, determined to put the past aside. After all, with another Lee Harker on the way, the future was far more important. 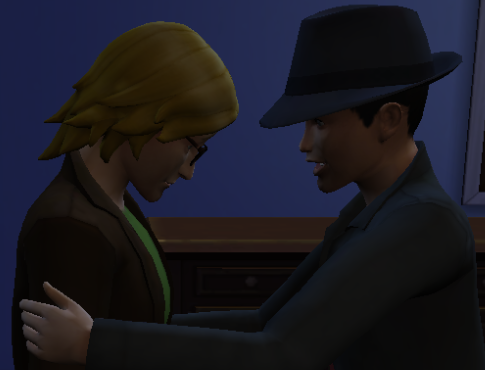 "I will find her, brother," Michael told Yuri. "I promise."